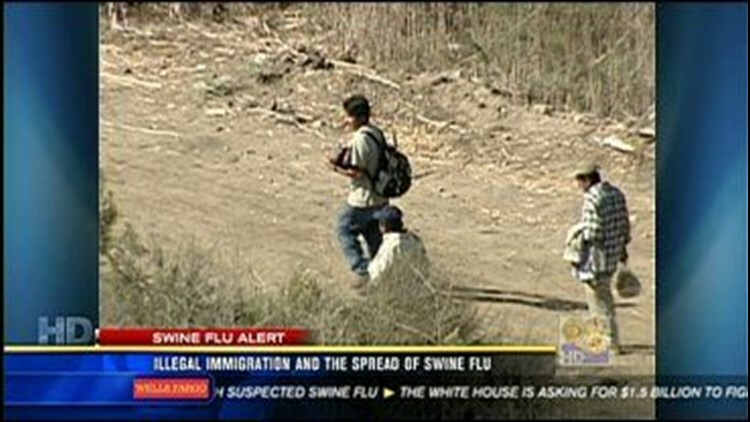 Health officials are concerned about the spread of swine flu from Mexico to the U.S. by illegal immigrants. Migrants in San Diego may not have access to medical care, which could lead to the spread of the virus within those communities. San Diego State University public health professor Thomas Novotny says county health officials should be surveilling local migrant camps for signs of swine flu and offer treatment to them if possible. "The treatment is not exactly perfect with this. It requires seeing a medical provider and paying for an expensive drug with 24 to 48 hours, so it's not an easy fix," Novotny said. Novotny, who worked for more than 20 years with the Centers for Disease Control and Prevention, says there is potential for major spread of the virus within the region's migrant settlements. "When they're concentrated in groups and some of them are sick and not able to isolate themselves, the potential for a spread is significant," he said. Novotny says those who are working and living illegally in the U.S. must be the targets of a major outreach campaign. Here in San Diego, Mexican Consul General Remedios Gomez Arnau is in close contact with community leaders to make sure they are telling migrant workers and visiting Mexican nationals about the swine flu. "It's very important to reach out to everyone, because the virus doesn't distinguish between migrant and non-migrant," Arnau said. Because of the outbreak, Arnau is also giving consulate employees the option of wearing protective masks during their contacts with clients. "If we see someone sneezing or coughing, we advise them to wear the mask we provide to them. So far we haven't had anyone who apparently could be sick," she said.